The Thanksgiving meal is the largest one most people prepare and serve every year. To make sure that your Thanksgiving dinner is wholesome and safe, Foodsafety.gov is offering tips. The turkey is the centerpiece of the meal, and it should be handled and cooked properly to make sure it is safe to eat. First, read labels carefully when you buy the bird. The label will tell you whether the bird is fresh or frozen. If you want to serve a fresh turkey at your Thanksgiving meal, buy it no more than two days before the meal. If you have purchased a frozen turkey, thaw it only with these methods: the microwave (for immediate cooking), the cold water method, or in the refrigerator. The USDA recommends using the refrigerator method. You can also cook your turkey from the frozen state. This method is completely safe, and in fact can be safer because no juices from the raw turkey can cross-contaminate surfaces or other foods. When you are ready to cook the turkey, make sure you do not wash it. Washing under running water spreads pathogens onto surfaces in your kitchen, because the bacteria can aerosolize. The only way to get of foodborne illness pathogens is to cook the turkey. Keep the raw turkey separate from all other foods at all times. Use separate cutting boards, plates, and utensils when handling the turkey to avoid cross-contamination. And make sure the turkey is cooked to 165°F. Tea it in three places: the thickest part of the breast, the innermost part of the thigh, and the innermost part of the wing. 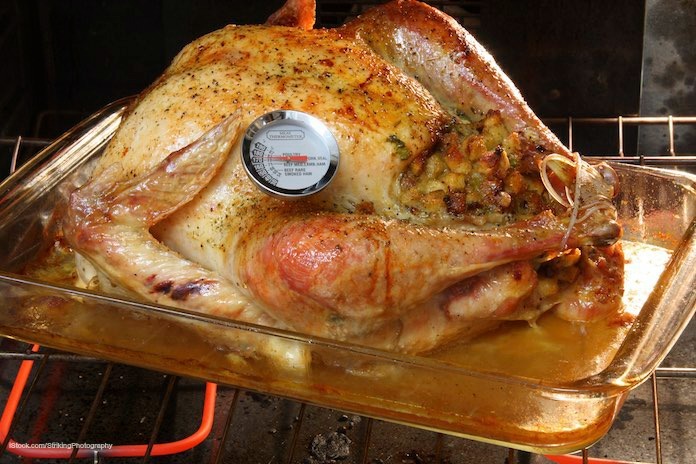 If the temperatures is not 165°F, return the turkey to the oven and continue cooking. After the meal, be sure that you follow rules for food safety for leftovers. Refrigerate leftovers within two hours of taking the food from the oven or stovetop to prevent bacterial growth. Store leftovers in shallow pans or containers to reduce the cooling time. Food that spends a lot of time in the danger zone of 40°F to 140°F can grow bacteria that can make you sick. Do not store stuffing inside a leftover turkey. Remove the stuffing from the turkey when it has come out of the oven and has had a standing time of 10 minutes. Refrigerate the meat and stuffing separately. Discard all leftovers within four days. Use the freezer to store leftovers you want to keep for a longer period of time. And if you are traveling home with food, or have given food to guests, make sure the food is in a cooler with ice or frozen gel packs if they live more than two hours away. The SUDA has many more tips to make sure your Thanksgiving meal is a success, including Debunking Thanksgiving Myths, Different Ways to Cook Turkey, and How to Safely Thaw a Turkey. Happy Thanksgiving!